Hyderabad: The Krishna Institute of Medical Sciences (KIMS Hospitals) announced the installation of next generation upgraded surgical robotic system da Vinci Si Model in its facility at Secunderabad. 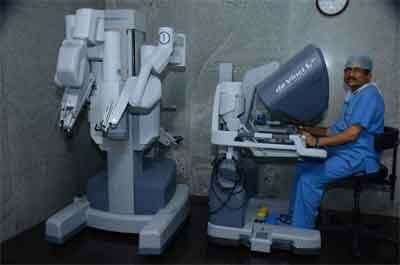 With its first Da Vinci robot setup in 2011, KIMS Hospitals has completed 700 surgeries. Now, the hospital has installed the next generation Da Vinci Si Model at a cost of two million USD. Currently, eight trained doctors in six medical specializations including Oncology, Gynecology, Urology, ENT, Gastroenterology and General Surgery at KIMS are performing robotics surgeries. Dual-console capability to support training and collaboration during minimally invasive surgery. According to available statistics, the number of robotic surgeries being performed in India has increased to 3000 to 4000 per year, which is still very less considering eclectic spectrum of our country. And KIMS Hospitals is at the fore-front to concoct its doctors and patronage this program to augment for the betterment of their patients. KIMS is also amongst the first hospitals to capitalize and gain expertise on robot-assisted surgeries. Some of the doctors who are in charge of robotic programme include Dr. Gopichand, Urologist, Dr Neena Desai, Gynecologist, Dr Lakshmikanth, Bariatric and Gastrointestinal Surgery, Dr D Madhu, Surgical Oncologist, Dr Kalyan Chakravarthy, ENT, Dr Suresh Kumar G, General Surgery, Dr MBV Prasad, General Surgery, Dr Vijay Kumar Bada, Surgical Gastroenterology.